The sunny Central Oregon summer created a perfect backdrop for a round of golf, happy hour and a meet-and-greet event at Eagle Crest. The second annual alumni summer gathering coincided with the Classes of 2012-2014 Ford Scholars Leadership Conference. 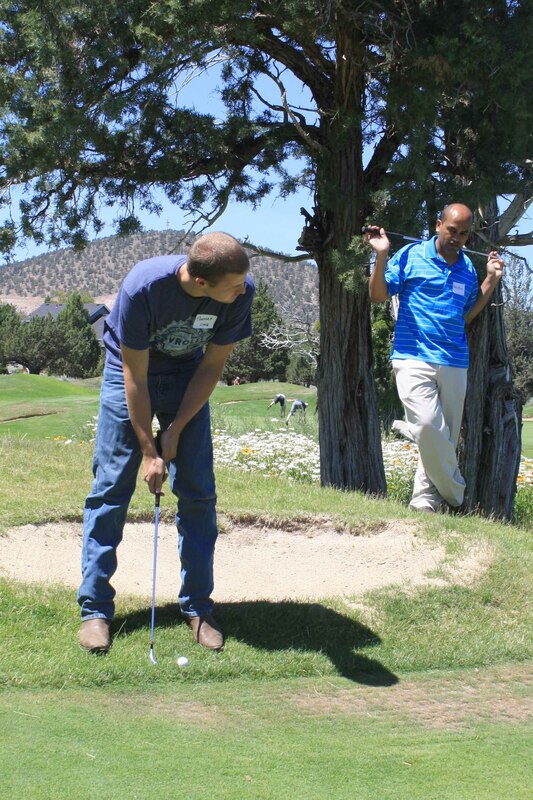 Twenty Ford Scholar Alumni and a few of their family members met up at the Eagle Crest Putting Course in Redmond, Ore., on Saturday, July 18, to try their swing at golf. They paired off into small groups and hit the course, reconnecting as they played the 18 holes. Scholars, and he attended the event because he wanted to know more about the FSAA. He supports the community service aspect of the organization. After a sunny round on the putting course, alumni and their families visited over refreshments at the Silverleaf Café. Class of 2008 alumnus Thomas Kyle-Milward carpooled with a couple of other alumni from the Portland area to attend his first FSAA event. He recalled how invigorated he always felt after the summer conferences as a Ford Scholar. “I left feeling recharged and ready for another term,” he said. That evening, alumni hosted a meet and greet with current Ford Scholars in the Golden Eagle Ballroom at Eagle Crest Resort Conference Center. Alumni introduced themselves and shared their school and career history before fanning out and connecting with Scholars. FSAA President Mary Chuinard was pleased with the turnout, noting that attendance was double that of the first gathering last summer in Sunriver.